An obelisk of granite, surrounded by granite columns and wrought iron panels, marks the spot where the Welcome Stranger nugget was discovered by John Deason and Richard Oates in 1869. The Welcome Stranger nugget weighed 2316 troy ounces (about 72 kg) and at the time of discovery was the largest known gold nugget in the world, measuring 60 by 45 by 19 centimetres. 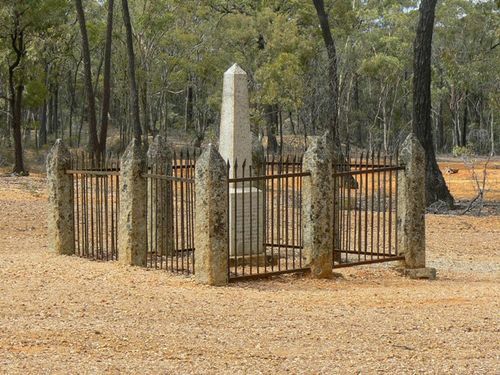 The memorial is located one and a quarter miles south-west of Moliagul in forest country. About a quarter mile south-west of the monument is a small cleared paddock where John Deason lived. The 'Welcome Stranger' was found on 5 February 1869 by Cornish miner John Deason, who was working in Bulldog Gully, near Moliagul in central Victoria. While searching around the roots of a tree he discovered, 3 cm below the surface, a gold nugget. He concealed his find until dark, then with his partner, Richard Oates, dug it out. They then held a party during which they revealed their find to the guests. The 'Welcome Stranger', then the world's largest-known gold nugget, was taken to Dunolly where it had to be broken on an anvil before it could fit on the bank's scales. It was worth nearly 10,000 pounds - around $3-4 million in today's money.